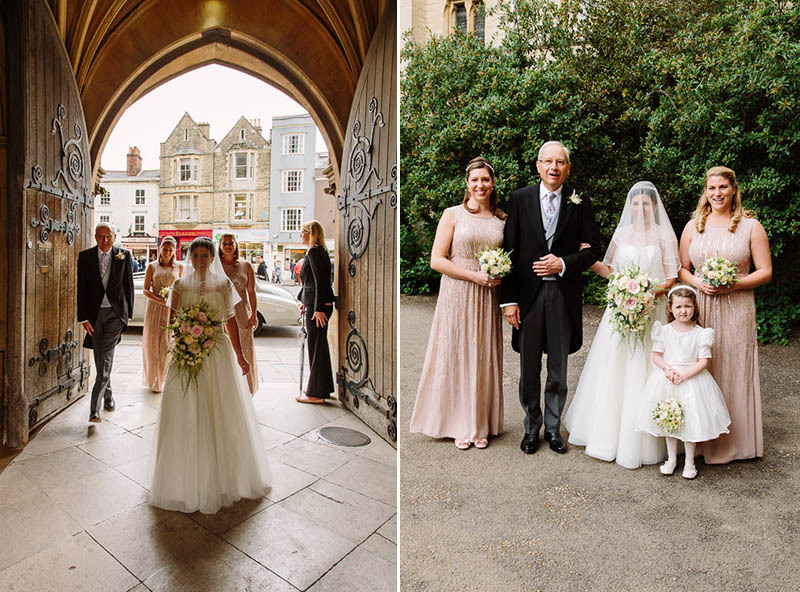 Lucy and Chris's elegant Balliol College Wedding Flowers, Oxford - Joanna Carter Wedding Flowers | Oxford, Oxfordshire, Berkshire, Buckinghamshire and London. 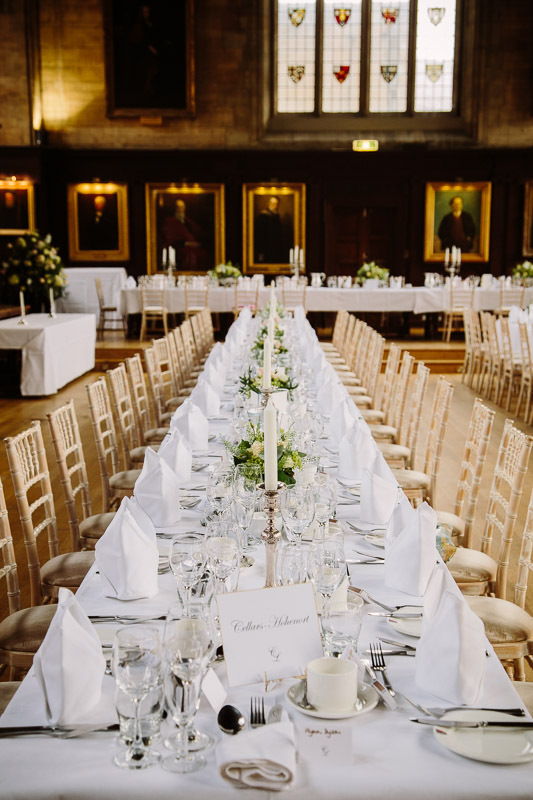 Lucy and Chris were lucky enough to hold their wedding in the stunning setting of Balliol College chapel and dining hall. 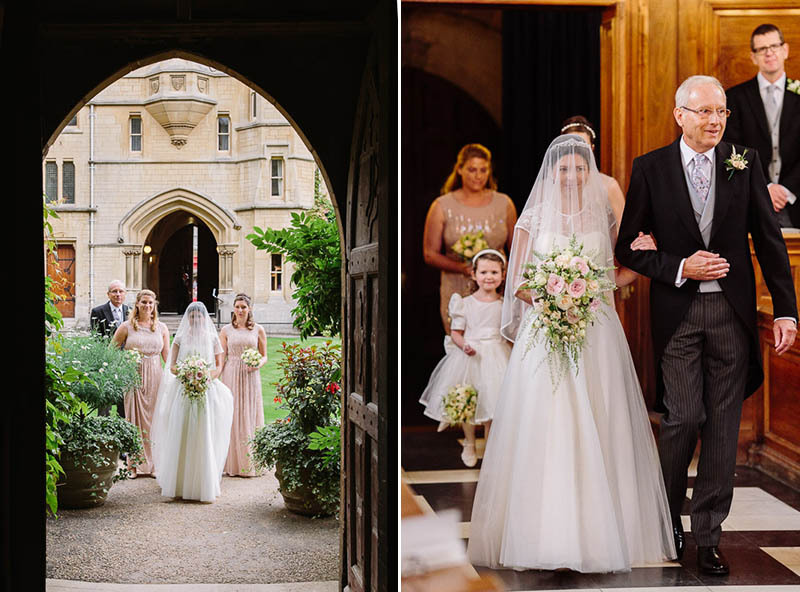 One of the oldest of the Oxford colleges, it has several lovely walled gardens and beautiful architecture which were a stunning backdrop for the wedding. 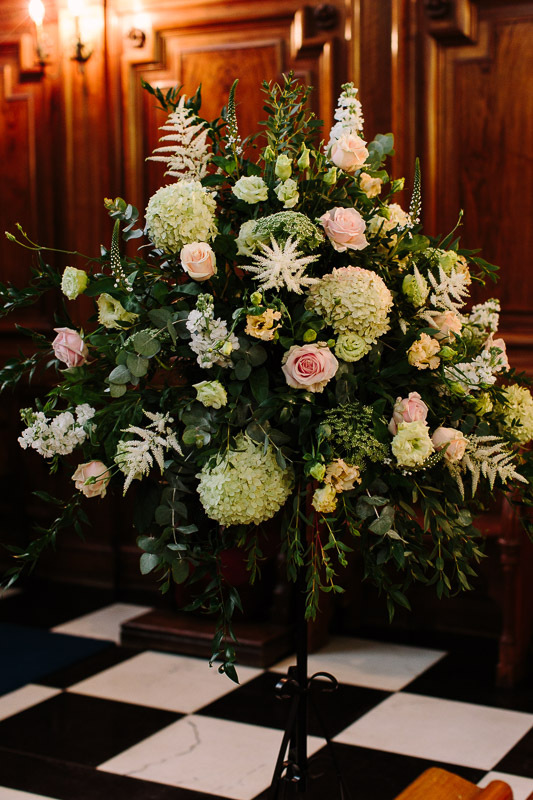 Lucy chose classic and elegant soft peachy pinks and ivory for her wedding flowers as these seemed to fit the surroundings well. 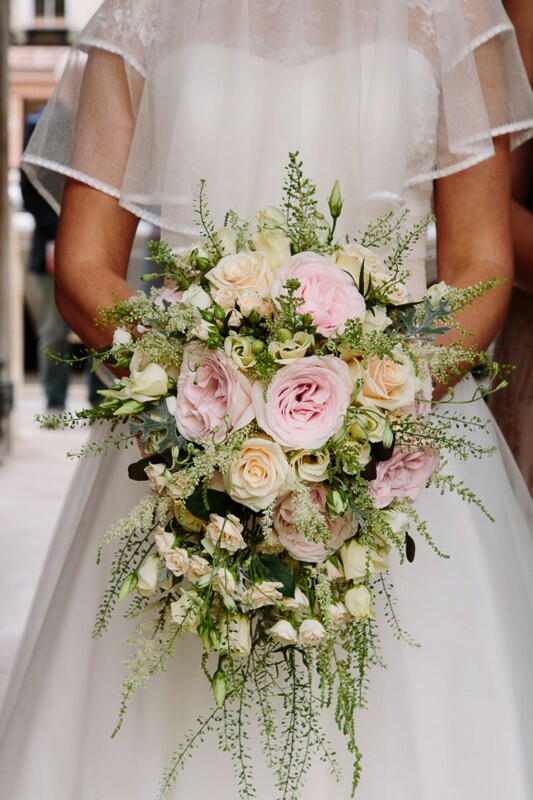 We used David Austin scented Keira roses in her bouquet which had a slight trail to it and mixed the roses with talea soft peach roses, astilbe, lisianthus and ivory spray roses. 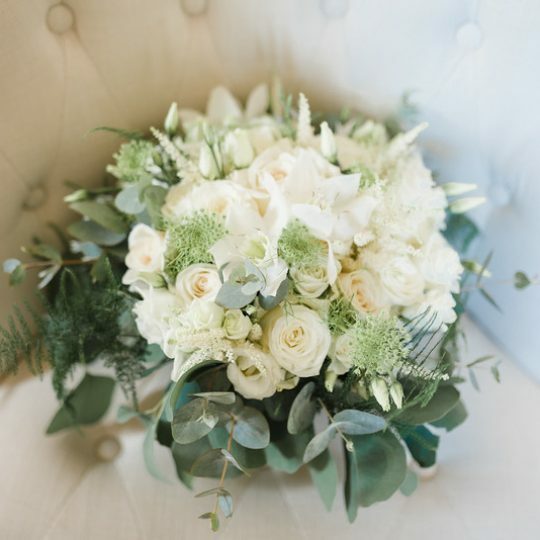 It was a lovely romantic and feminine bouquet. 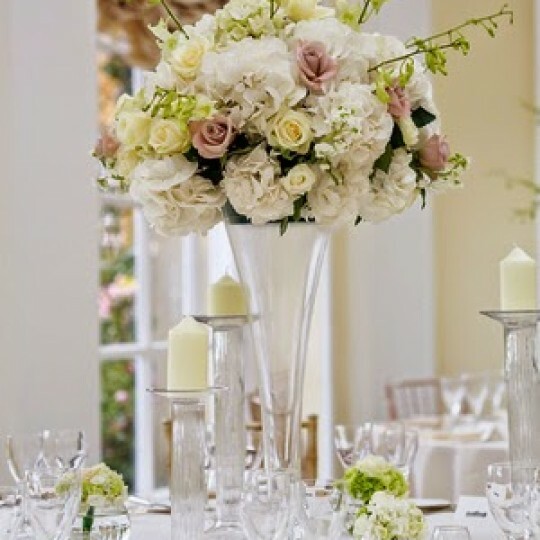 A big thank you to Harley and Susie at www.barkerevans.com for these stunning photos. 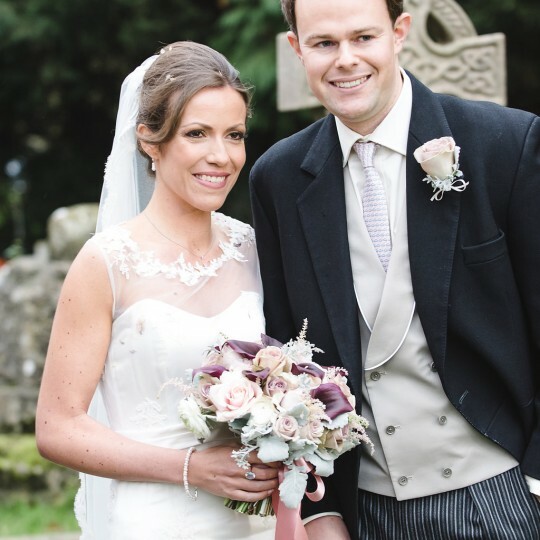 Every wedding we do with you is so beautifully captured and this one is no exception! 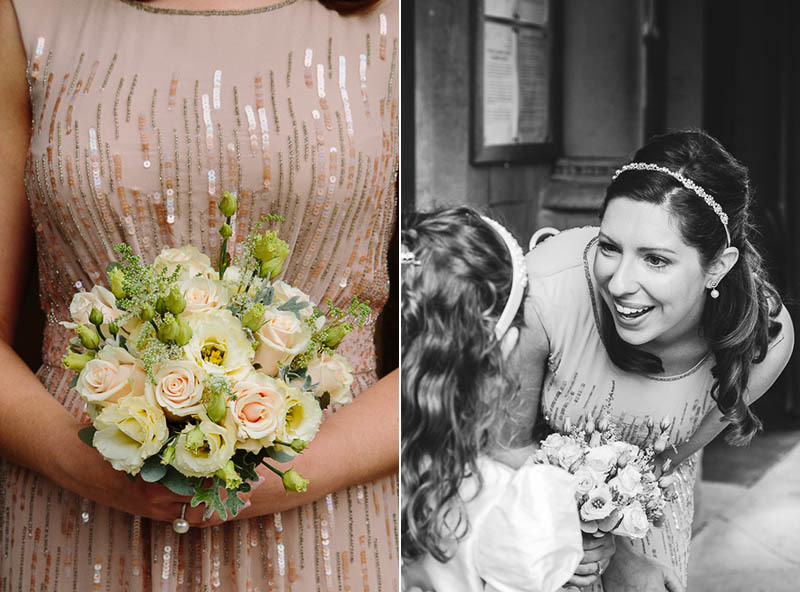 The bridesmaids carried hand tied bouquets of peach talea roses with ivory lisianthus which toned perfectly with their dresses. 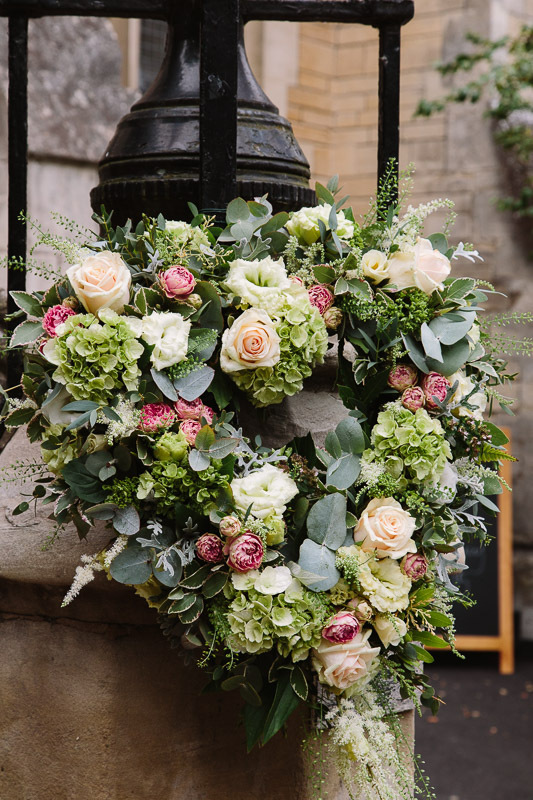 The chapel is so ornate and beautiful that all we needed to add was a pair of elegant pedestal arrangements at the top of the aisle and two heart shaped wreaths that we attached to the wooden balustrade where the bride and groom stood to take their vows. 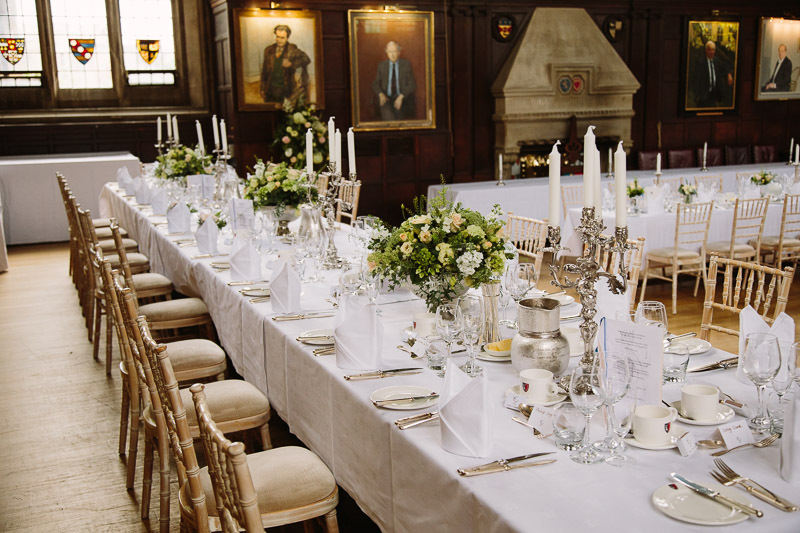 Following the Chapel ceremony, Lucy and Chris’s reception was held in the stunning dining hall at Balliol with its beautiful wooden panelling and portraits of past masters. 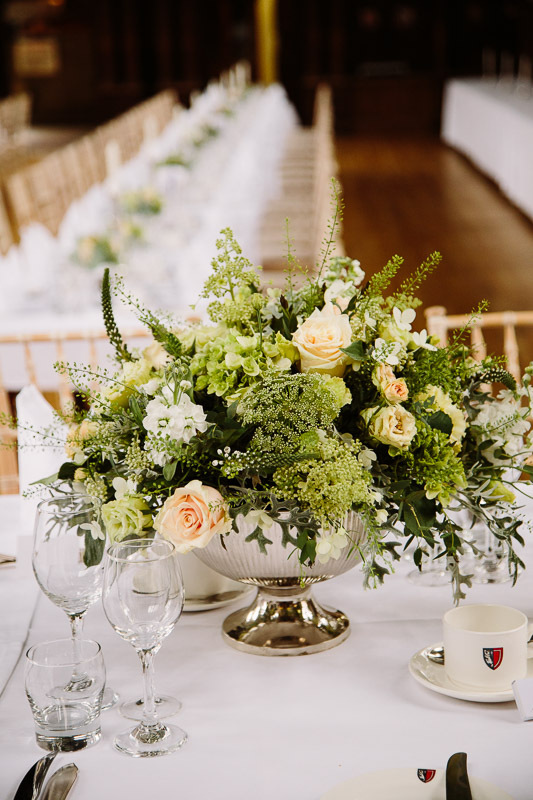 For the top table we made large silver rose bowls of flowers. 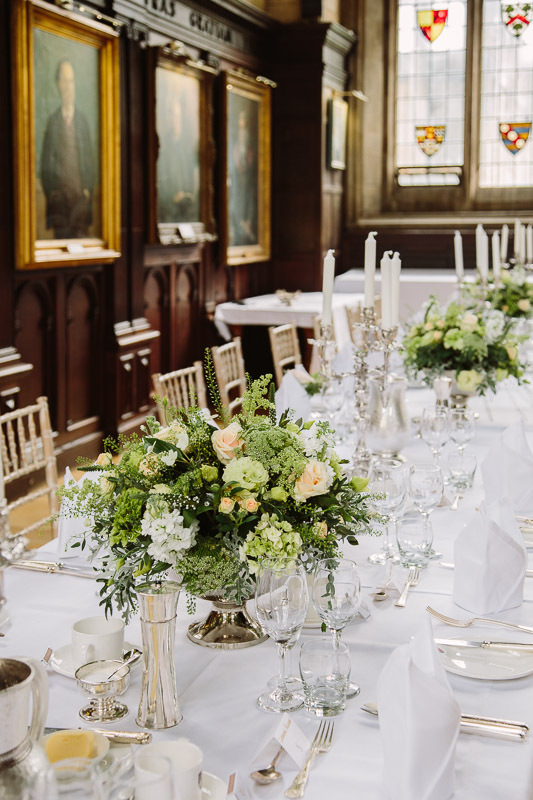 On the guest tables we placed mixed smaller silver vases full of flowers with the college’s small silver candlestick in between. 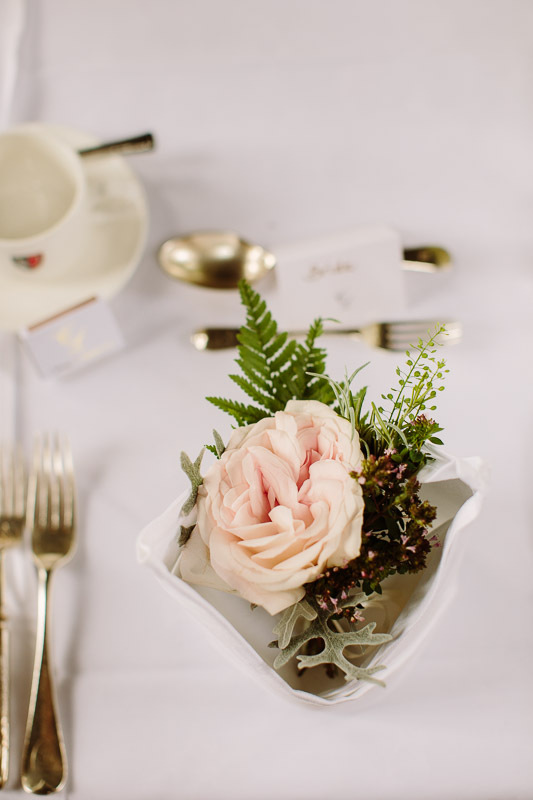 We made little rose clusters for the bride and groom’s place settings. The heart wreaths that had been in the Chapel were moved to sit on the steps at the entrance to the dining hall.